The forecast for a white Christmas in the North Carolina mountains called for nearly 3-5" of fresh powder to fall beginning on Christmas eve. 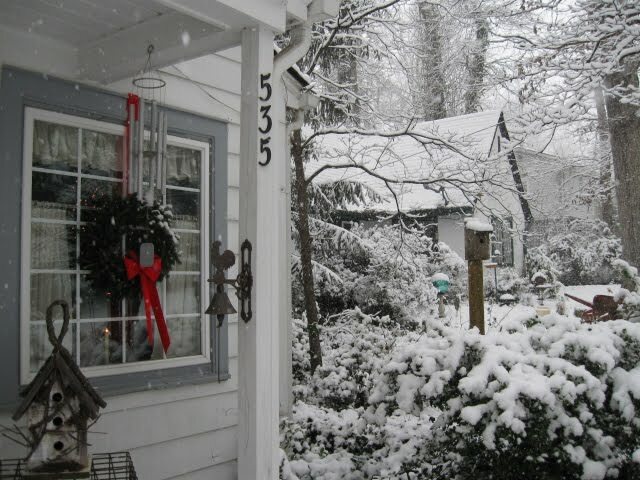 As we watched the local weather expectantly, we began to wonder if we'd really see our first white Christmas since moving to Hendersonville nearly 18 years ago. 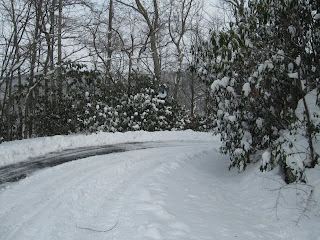 Granted, we've seen our share of snow since we relocated to the mountains after living for 11 years in the deep south. Just a month after our arrival in 1993 we were greeted by the arrival of the "blizzard of 93" that dumped a foot and a half of snow followed by 75 mile per hour winds. And this past winter we witnessed a total snowfall of 36", the whitest winter in decades. But we were skeptical of the forecast, especially as it evolved; snow on Friday; no, snow beginning on Saturday. 3-5", or maybe just 1-2". We bedded down Friday night after listening the the 11 o'clock forecast of 1-2" thinking we'd enjoy our little snow. Anything that could be considered a white Christmas would be just fine. And, when we awoke Saturday there was no sign of snow. Mary Beth commented that it was much like the day before the blizzard hit - no sign of anything resembling snow. But then it began; and it continued to snow all day and most of the night. 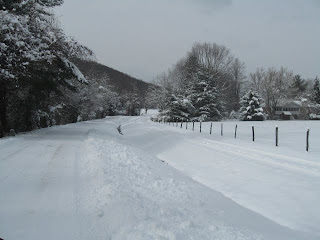 When all was said and done we had depths of 7-10" across the county. Fortunately, and thanks to our daughter, Kimberly, we made it through the snow in her 4wd SUV to the base of Davis Mountain where we were greeted by our son-in-law, Steve, in his Polaris Ranger all terrain vehicle. We threw our luggage and gifts under the tarp in the back and piled in, snaking up the snow covered road to our daughter Kara's and her husband, Steve's mountain home. And, the next day we made it safely home again in the same manner. 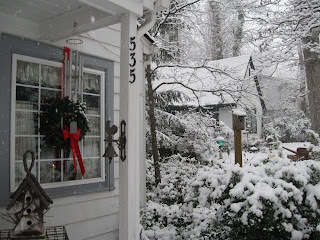 Here are a few photos of the snow from our perspective. I've been asked to provide the invocation and benediction for my community's Pearl Harbor Day observance. It's an honor that I don't take lightly. As an offspring of an Army Air Corps veteran and the grandson of a soldier injured in WWI, I understand the meaning of military service for one's country. The examples of my father and grandfather, as well as my wife's father, a combat engineer in Germany, enabled me to answer my country's call to serve as a combat officer in Vietnam. My desire is that all our nation's brave men and women in uniform will be honored for their sacrificial service. Heavenly Father, we gather today in remembrance. On this day we remember the shock of an infamous, unprovoked attack. But we also remember the resolve and courage of a nation that knew it must stand and fight for its cherished values. Today, on this 69th anniversary of the attack on Pearl Harbor, we honor the memories of the 2400 brave Americans who gave their lives, as well as all those who stood in our defense. This day of remembrance is a time look back and recount their sacrifice for the cause of freedom. But we also must look forward and ask for your grace and guidance as we face another foe in the form of radical Muslim terrorists bent on our destruction. Let us also look inward to find the character and courage to stand for the life and liberty with which you have endowed us. Finally, Lord, we look upward in praise and thanksgiving as we acknowledge that you have shed your grace on us. May all we say and do today bring honor to those who have so nobly served, and bring glory to your Holy Name. Amen. Again, Father, we thank you for this occasion to pause and remember these heroes. Help us to draw courage from the example of the brave Americans we honor. As we go from here, may we be ever vigilant and ever valiant. Steel us to stand, Father, for this land and this lighthouse that is the United States of America. As in the words of these great hymns of faith, we pray “Guide us, O Thou Great Jehovah,” and we ask that you grant us wisdom and courage for the facing of this hour. I ask all this in the name of your Son and my Savior, Jesus Christ. Amen.